The regulation of e-cigarettes is a relatively new topic. While the e-cigarette sector is fast evolving, the optimal regulation of these products is yet to be fully understood. Some wisdom may be borrowed from the regulation of cigarettes, but many tobacco relevant policies may not be applied to these new products. Evaluations are underway on many aspects of e-cigarettes, for example: their safety, potential health risks, illicit trade, taxation and advertising. This paper examines yet another dimension – one which arises at the intersection of international health and trade law. 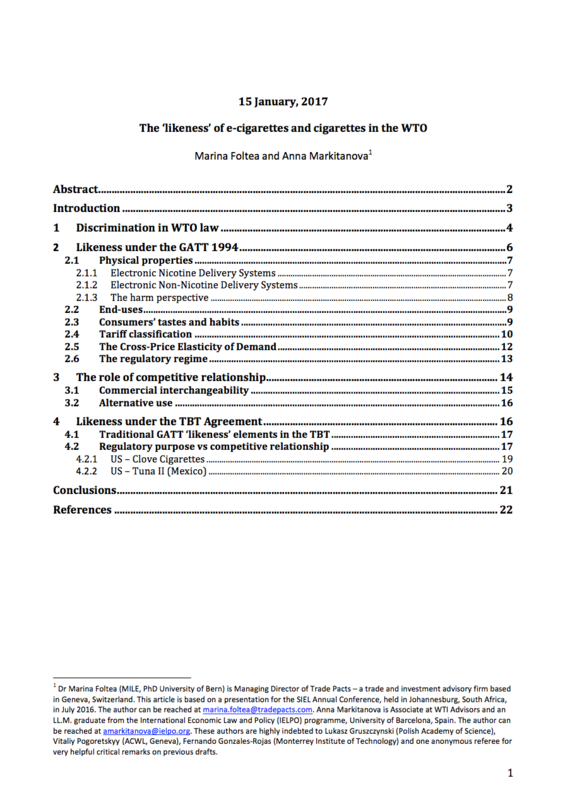 Namely; it looks at whether e-cigarettes and cigarettes may be found ‘like’ in a WTO dispute challenging trade restrictive measures applying to e-cigarettes.